Plastic. A fully flexible, life-size vertebral column consisting of the occipital plate; cervical, thoracic, and lumbar vertebrae; sacrum; coccyx; complete pelvis with symphysis; and removable femur heads. 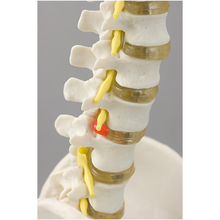 The model also features representations of the vertebral arteries, spinal nerve branches, and a prolapsed L3–L4 intervertebral disc. Plastic. 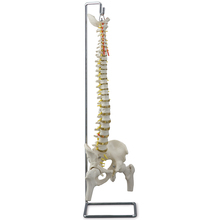 A fully flexible, life-size vertebral column consisting of the occipital plate; cervical, thoracic, and lumbar vertebrae; sacrum; coccyx; complete pelvis with symphysis; and removable femur heads. The model also features representations of the vertebral arteries, spinal nerve branches, and a prolapsed L3–L4 intervertebral disc. With metal stand. Size, 95 x 20 x 20 cm.